I love having a blog, mostly because if there is an ever an argument about when something happened or I need to reference how long I've been doing something, a simple search through my archives will reveal the answers. For example, it was almost a year ago exactly that I attempted my first real "swim" - that is, moving through a body of water using some method other than the doggie paddle. For a while I was training for a triathlon but couldn't keep up with the schedule. I decided to scrap three sports in order to focus on running and yoga - a wise decision, considering my performance in the Houston Marathon! In the last few weeks of training for Houston, I started to daydream about other sports, other hobbies. Running 25-30 miles a week will do that to a person. And since the marathon (which was just ten days ago - seems like much longer than that!) I've dipped my toe in two of those hobbies - rock climbing and swimming. 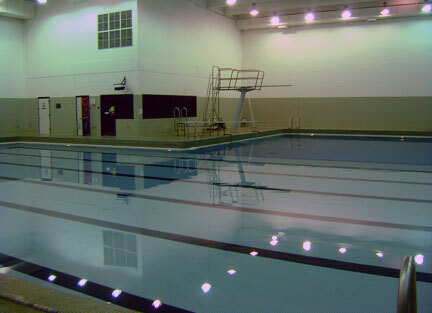 The indoor pool on campus. AKA WHERE THE MAGIC HAPPENS! Today was my first time back in the pool since... oh... June? I can't remember, but it's definitely been a long time. I was afraid I wouldn't remember how to swim, that all the work I put into perfecting my stroke months and months ago would be lost. Not so! As soon as I got into the pool it was like I'd never left. Well, except for a little thing called "endurance." But that will come back eventually. In the meantime, I'm glad that I can still do a decent freestyle, that I remembered how to breath on both sides, and that I could find my swimming cap. 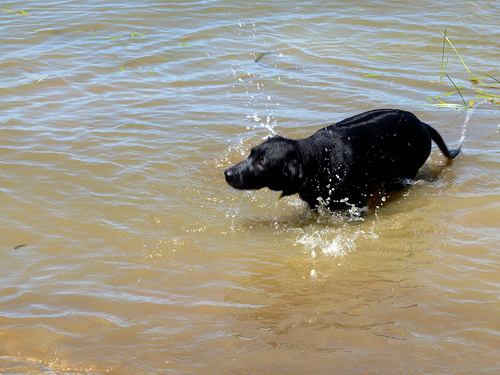 Calvin demonstrates the doggie paddle. And as if one milestone wasn't enough, I also managed to conquer a long held fear - showering at the gym. The pool is open from 6:30am to 8:00. If I swam for an hour, there's no way I could go home, shower, change and be back on campus by 8am for work. So last night I packed up everything I would need to make myself presentable and used the locker room to shower and clean up. And guess what? It wasn't so bad. Our rec center is still shiny and new and because it's on a college campus, the gym is pretty empty before 7am. Which means I was the first person to use the shower and it had been freshly cleaned. Such a relief! How do you feel about public showers? Grossed out or an old pro? Personally, I have a thing about bathtubs. I hate taking baths and always prefer showers. I'm glad I'm getting over my fear, though - it makes working out in the morning a whole lot easier!